Chess and cancer research have one thing in common: It takes strategy to defeat the opponent. And that's exactly what scientists at the MDC are doing. They are seeking to selectively make only those cancer cells aggressive that would otherwise evade chemotherapy—and then lure them into a trap. In chemotherapy, cytostatics—substances halting cell proliferation—prevent cancer cells from growing and induce cellular death. This approach often leads to success but has a number of drawbacks. It has a negative effect on healthy cells, and may also cause significant side effects in some patients. What's more, in the case of very aggressive tumors, some cancer cells usually survive the therapy. "The remaining cancer cells are especially dangerous because they are altered in such a way that physicians often no longer know what type of cancer cells they are dealing with," explains Dr. Gaetano Gargiulo, head of the Molecular Oncology research group at the Max Delbrück Center for Molecular Medicine in the Helmholtz Association (MDC). This makes it difficult to choose the right substances for further treatment. In a certain form of non-small cell lung cancer, the chemotherapy frequently results in altered cancer cells that are almost untreatable. Those developing new treatments must keep this possibility in mind. "Like a good chess player, we must think several moves ahead instead of just reacting to the present situation," says Gargiulo. Together with his team and researchers under Professor Maarten van Lohuizen of the Netherlands Cancer Institute in Amsterdam, he has tested how this might work on mice that were injected with cells of a special form of non-small cell lung cancer. In this form of non-small cell lung cancer, the cancer cells produce large quantities of an enzyme called Ezh2. The enzyme represses a number of tumor suppressor genes, which normally stop cells from multiplying out of control. Agents that inhibit this enzyme and thus reactivate the tumor suppressor genes are currently being tested in clinical studies. 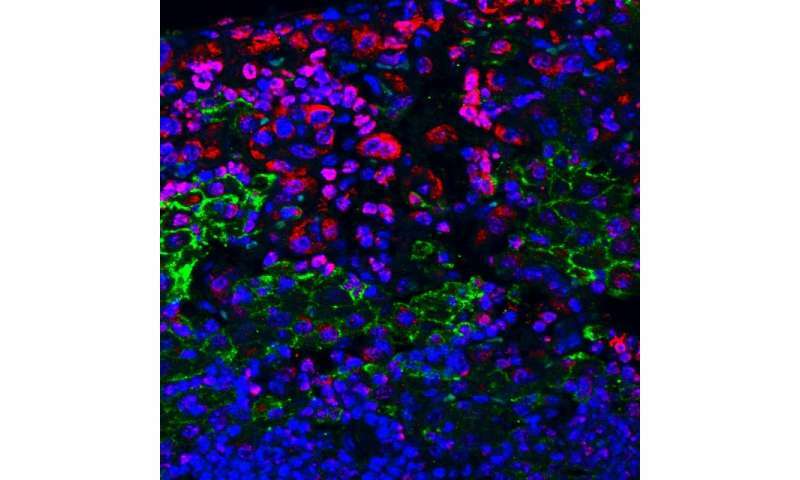 "In our mice, this agent initially worked as expected and inhibited the multiplication of tumor cells, thus keeping the cancer in check," says Michela Serresi, the lead author of the publication and team leader associated with Gargiulo's research group. But the researchers had also expected the agent to lose its effect over time. "Interestingly, there always developed an inflammatory situation that in turn supported tumor growth," says Serresi. The remaining cancer cells thus became even more aggressive as a result of the treatment. This is precisely where the MDC researchers are focusing their efforts. They are intentionally sending the tumor cells down this path—and setting them up for a trap. "Although the cells may be extremely aggressive once they are resistant to the Ezh2 inhibitor, they are dependent on the inflammatory situation," explains Gargiulo. "If we can foresee this development, similar to the way skilled chess players think through the possible moves their opponents might make, and even deliberately force it to occur, we can also selectively combat it." Therefore, in the second step of the therapy, the researchers administered the mice an anti-inflammatory substance—putting the cancer cells in checkmate. However, it is still a long way to go before patients will see benefits from these new treatment strategies. "If we intentionally make cancer cells more aggressive, we have to know exactly what we're doing," says Gargiulo, adding that, for example, it would be necessary to search for biomarkers that enable clinical scientists to clearly predict in which patients this strategy will actually be effective. "We first have to gather sufficient data and experience in the lab before we can even think about testing this treatment strategy on patients," emphasizes Gargiulo.